One lunch time while out in San Jose we took a little drive to Mountain View where I was promised we’d have a truly American dirty burger joint experience. We arrived at Clarke’s, which doesn’t look like much from the road, it’s a bit of a shack and not remotely fancy and you could easily pass it by… But that would be a big mistake. Service is simple. There’s an immense menu of burgers, ribs and the like plastered up on the wall, you order and pay at the counter and your name gets called out over the tanoy when your food is ready. A system we’re all very familiar with. There are so many options if I visit again I’ll definitely take my time in giving the menu a proper read as I was so overwhelmed I picked quite hastily and I’m sure I missed some gems! 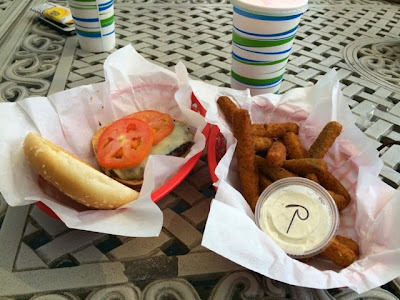 I went for the Monterey Jack cheese burger with a side of zucchini fries, which came with a ranch dip, and a strawberry milkshake. The burger was pretty huge, as expected, but could have done with a bit more cheese to make it extra oozy. The patty was really juicy and tasty. Not the best burger I’ve ever had but very good. Zucchini fries were breadcrumbed as opposed to battered which made a change and I’m a huge fan of ranch dressing so for me it was the perfect accompanying dip. I pinched an enormous onion ring or two from my friends so I can also vouch that they were excellent. For my first proper American diner dirty burger experience, Clarke’s definitely delivered. The overall experience of the place makes it well worth a visit and the food is pretty decent too!